The iQue Card (Chinese: 神游卡) is a removable memory card of the iQue Player, used to store games and the "Upgradeable Operating System". It is located on the bottom of every unit. The iQue Card is housed in a plastic shell, which contains a Samsung K9F1208U0M-YCB0 NAND chip on a special PCB codenamed "DOOKIE". The contents of the NAND are documented on the NAND page. 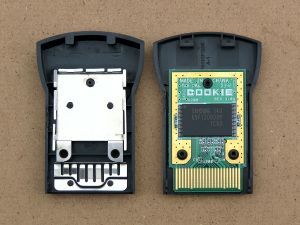 The DOOKIE board is very basic, and it contains the NAND flash, a few resistors, and an edge connector to connect with an iQue Player. The connector has a 1.1mm pitch and seems to be custom made. No other commonly-available connector appears to fit in it except the MicroSD.